A couple weeks ago I was preaching about the signs that follow believers. I’m talking about the Miracles that will be happening with believers. You gotta believe with all your heart, mind, soul, and strength. I’m serious. It’s time to show the people out there the Hope in JESUS. That’s why change needs to take place. Let’s ask ourselves the hard questions because salvation is serious. It’s where we end up forever. Are there any areas in our lives that we need to change before we stand before GOD on judgment day? This is a very important question! We need to do a self-evaluation regarding our spiritual lives. Check our hearts. When we become Christians, GOD EXPECTS US TO CHANGE. Thinking must change. Behavior must change. Commitments must change. Everything’s gotta change that doesn’t measure up to the kind of life that GOD wants us to live. The change that GOD wants us to have is not just a one-time change, because the Bible teaches that we are to continually change and model our lives to be more like JESUS. It’s an ongoing process. Change is good. John means that we gotta walk through our home, our workplace, the grocery store, everywhere we go we should be talking, acting, and thinking like JESUS because JESUS is the perfect example for us to model our Christian life after. GOD expects us to changes in our lives so that we can be the kind of people who HE wants us to be. Amen. “The meanest man in the Texas Prison System” was a title well earned by Clyde Thompson. Two-time murderer at age 17, youngest man in Texas to be given the death sentence. But 6 hours before he was to die, his sentence was converted to life. After that, Thompson engineered 3 unsuccessful escape attempts and then, murdered two fellow inmates. Of course he was labeled incorrigible and given a solitary confinement cell. But after 28 years, he was released from prison. He spent the rest of his life serving as a Minister until he died a few years ago by natural causes. Now, what made the difference? A guard gave Clyde Thompson a Bible to read and Jesus came into his life. A four-time murderer, in solitary confinement, changed completely. Anyone can change when given the Hope in JESUS and they need to be willing to change. We can supply the right stuff but only JESUS can change people. IF you really want to change things in your life, then change is possible. There is hope for a new beginning and a new way of life. If you know that you need to make some changes, then you can do it with the help of JESUS. I’m excited for the changes coming to JAM because the signs and Miracles will always be going on because that’s what JESUS wants. The signs will follow each believer here. It’s time for change. When we are a part of the Miracles, that’s so exciting. Change is always possible through JESUS. JESUS has so much more for us and all believers. It’s time to make the change for JESUS. The more you fall in Love with JESUS, the more you’ll want to change for HIM. Peter changed from a fisherman to a fisher of men. Matthew changed from a corrupt tax collector to a beloved Apostle. Paul changed from a persecutor of the church to a lover of the church. Zacchaeus changed from a thief to a man who gave half his possessions to the poor. JESUS ain’t concerned with the outward appearance of people because people can put up a phony front. That’s why HE looks at our heart because you can’t hide anything from HIM. Over time our true colors always comes through. If change is coming in your life, it’s gotta start in your heart. But how do we know if our hearts are not right with God? If you have bitterness, hatred, anger, unforgiveness, sexual immorality, envy, or jealousy, lingering in your life, if you are constantly critical toward others, or you have any type of sin in your life, your heart needs some changes. If your heart needs some changes then the good news is that you can change your heart condition. Your heart can be renewed and given spiritual treatment through JESUS. 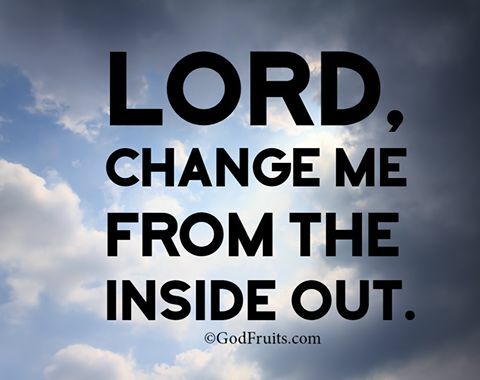 We need to go to GOD in prayer and ask HIM to change our hearts. Then we need to let HIM. HE will if we really want to change. We need to stay focused on JESUS so we can be more like HIM. Regardless of how far a person’s heart is from GOD; GOD can change it.